We recommend registering on a computer, and not a mobile device. if you receive information that the “form is outdated” or similar message, please clear your cache and/or try a different browser. We are a volunteer organization and cannot provide technical support for registering. Again, please try on a computer if you are having problems with your phone. Our web hosting company is aware of the situation and working on it — no need to call us, we do not maintain an office. Be patient and try again. You will receive a confirmation by email when your registration is complete. First and foremost, it's a great way to give back to the program. Parents of our campers are always wanting to donate more to the program - and this is an easy way of doing it. If you consider that Safety Town is roughly a twenty (20) hour program - the cost of the Ambassador registration price equates to roughly $5.00 per instructional hour -- and includes a t-shirt. It's a heck of a deal! Keep in mind that Safety Town runs 100% on donations and registration fees... so every dollar counts! Plus, as an Ambassador, if your plans change and you need to switch sessions -- we allow you do do that - even if the session you want to move to is full. Don't want to be an Ambassador? You can wait until noon on April 1, 2019 and register at that point. Sessions are Monday through Friday for two weeks. PLEASE READ ALL OF THIS INFORMATION BEFORE REGISTERING! Please note that all registrations are FINAL and NON-TRANSFERABLE. The first Monday of each session is orientation for both parents and campers. Be prepared to stay the entire session. The last Friday of each session is graduation. We encourage everyone to invite family members for this special ceremony! Your child must be either 5 or 6 years old at the time of the session to participate. Safety Town for operations). This is a great way to give back to the program! Regular registration opens April 1, 2019 at noon. All registrations final. No waiting lists. Volunteer registration will open April 1, 2019 and be in paper application format. 2. Ambassadors may begin registration on February 1, 2019 for a $105.00 donation. As an Ambassador, your child will receive a t-shirt and have the ability to switch sessions if necessary up until the start of Safety Town. One ambassador registration per child. You also get to register sixty (60) days prior to General Registration. Regardless, all registrations are final. 3. General registration begins on April 1, 2019 at a cost of $35.00. Each child will receive a t-shirt with their registration. General registrants cannot change sessions without re-registering and paying another fee. You child MUST be 5 or 6 at some point during the Safety Town Sessions to participate (not older, not younger). Regardless, all registrations are final. 4. All registrations will be done online - no paper applications. We do not accept special requests for groupings unless registered as an Ambassador. 5. Children will be required to bring a helmet to class to use on the bikes, If you would like to have a Safety Town helmet, you will have the option of adding one during the registration process for $15.00. You have the option to purchase a helmet online. Please don't bring helmets to class on the first day. 6. There will be 100 slots available online per session. First come, first serve. 7. All sessions are FIRST COME, FIRST SERVE. If the session is not showing as available, then it is full. There are no waiting lists. 8. All registrations are final and NON-TRANSFERABLE. All fees are non-refundable. 9. If you have a special financial need and would like to submit your situation and child for one of the reserved "scholarship" positions,please e-mail the administrator for a scholarship application. 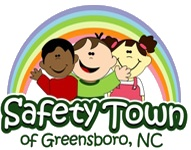 IMPORTANT: THE REGISTRANT IS THE NAME OF THE CHILD YOU ARE REGISTERING FOR SAFETY TOWN. Make sure that when you register, you only submit your request ONCE. If you click it more than once, you will be charged accordingly.